On this date in 1820, Scottish radicals John Baird and Andrew Hardie were hanged and then posthumously beheaded (execution broadside | another) at Stirling for treason. 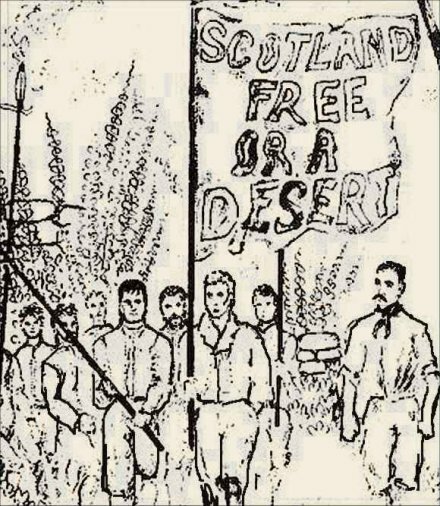 They were the casualties (along with James Wilson, who suffered the same fate on August 30) of the “Radical War”, a short-lived Scottish uprising for economic and political reform. The whole realm was convulsed by the birth pangs of industrial capitalism: artisans driven into factories; urbanization, exacerbated by lagging political representation for burgeoning population centers; and the revolutionary ideas of 1789 everywhere afoot in Europe. Indeed, ever since the cataclysmic French Revolution, nervous authorities had kept a very tight lid on excesses of popular agitation. On May 1, 1820, London police hanged the Cato Street conspirators, a small group of radicals baited into plotting an assassination by an agent provocateur who meant to destroy them. Similar methods were employed further north. Troubled by dangerous reform movements, the government itself helped instigate a violent rising so it could identify and round up radical elements. Long story short: in spite of giving itself a bit of a fright with the breadth of response to a general strike, it got a few easily crushed firebreathers to march out in arms. Baird and Hardie, two weavers (an artisan profession that had been particularly affected and therefore particularly radicalized by incipient industrialization), were two of its leaders. Traitors’ heads were all a part of the dialectic of authority and legitimacy, the prospect of popular violence in the streets and official violence on the scaffold helping validate moderate reforms as sensible accommodations by both state and populace. The lesson was one for putative radicals and the authorities as well — attempted risings and executions were to be expected if the opportunities to engage in constitutional activities … were shut down in favour of relying on the machinations of spies. This lesson looks simple enough in retrospect. But states that did not heed it as the 19th century unfolded ultimately charted a very different course. That intervening history, Pentland observes, has left layers of contesting interpretative frameworks to debate the proper understanding of the Radical War “martyrs”. The usability of 1820 was enhanced by its leaving, like William Wallace, precious little in the way of documentary information on actions and intentions. This has allowed the martyrs to be imagined and reimagined in a number of different ways and recruited to a range of political narratives: as the innocent victims of rancorous Tory persecution and as an object lesson in the strengths of British popular constitutionalism; as heirs to the Covenanters and as exemplars of the continuing constitutional duty to resist tyranny; as prototype proletarian revolutionaries; and, latterly, as insurrectionary republican nationalists. * “‘Betrayed by Infamous Spies’? The Commemoration of Scotland’s ‘Radical War’ of 1820”, Past & Present, November 2008, 201(1).